A Vietnamese entrepreneur has inspired Sheryl Sandberg, chief operating officer of Facebook, by her vision to empower women with a startup company that offers city tours led by female bikers. Nguyen Thi Huong Lien’s name was brought up by Sandberg as the executive addressed a crowd of thousands of world business leaders and diplomats at the APEC CEO Summit in Da Nang on Friday. Lien was the founder of the ‘I Love Hue’ tour, which operates motorbike tours that introduce visitors to the Vietnamese lifestyle in and around Hue City in the central region. “Guests ride on the back of motorbikes, expertly (and safely) driven by the Hue Lady Riders,” an introduction on the company’s official site reads, highlighting its focus on women. 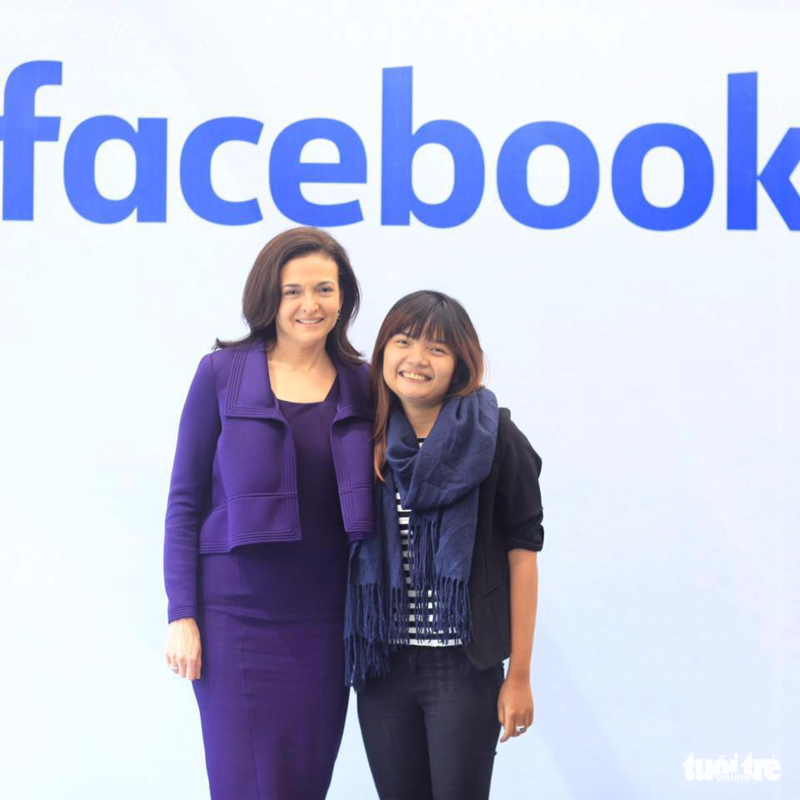 Sandberg had met with Lien the day before, where the Facebook executive listened to the young entrepreneur’s business ideas as well as her expectations for improvements to gender equality in Vietnam and worldwide. At Friday’s summit, Sandberg told the audience about Lien’s startup story to demonstrate her point that when women decide to run a business, they are able to achieve big things. In 2014, Lien founded her travel startup in Hue City at the age of 20 with only US$100 in her pocket. “I like to meet people to learn and share experiences. I dream to be a young leader and to take ownership of my life,” she writes in her self-introduction posted on the company’s site. The dream had led Lien to hire mostly women, and until how she has employed as many as 75 female bikers who have become the soul of the company. In June, Lien’s travel startup was honored with the WISE Women’s Leadership Awards, which offered mentoring through Vietnam’s Women’s Initiative for Startups and Entrepreneurship (WISE) to help launch the company on a larger scale. According to the young business leader, a team from Facebook had got in touch with her in Hue a few months back to film a document about her startup. The clip was later viewed by Sandberg, who said she was immediately inspired by Lien and wanted to meet her in person for further discussions. On Thursday, Lien was invited to Da Nang for a private meeting with the Facebook COO together with four other Vietnamese entrepreneurs. The female founder said she had even received a personal email from Sandberg, in which the Facebook executive gave words of encouragement to Lien to keep her passion burning. Sandberg also presented Lien with a signed copy of her book Lean In.